Corpor@te Facilities Services Ltd are delighted to announce that we have been awarded a dual contract for the provision of cleaning and security services at White River Place, St Austell. White River Place opened in 2009 and is owned by Ellandi and managed on their behalf by Workman LLP. The centre is open air consisting of 155,000 sq ft of retail space, with public toilets and a 550 space multi story car park, and back of house areas including a service yard. 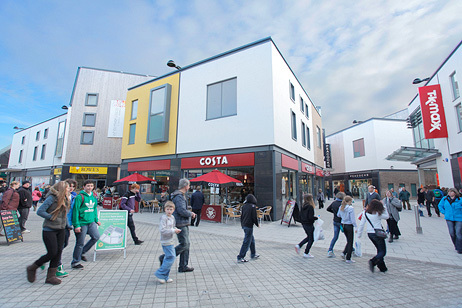 The service requirement includes the day to day cleaning of all external and internal areas of the centre and its car park, plus periodic’s for high level building and canopy cleaning along with the day to day security of the centre including, CCTV monitoring, patrolling, Retailer liaison & Support, Customer service & Management of the multi storey car park. As part of the contract award, Corpor@te Facilities Services will be introducing new cleaning machinery an investment of over £12,000 as well as install and implementing CFS 3D our own real time reporting system to assist the cleaning and security teams in their daily tasks within the centre. Other added benefits include providing the centre with branded uniform to assist with raising the centre’s brand awareness and also highlighting the onsite team to members of the public that may require assistance.